Our Accessory Shop is s tocked from floor to ceiling with a wide array of products. Accessories aren’t a sideline at Proctor Marine. Our Accessory Shop staff is dedicated to accessories and nothing else. We are known province-wide for excellent selection, great prices and amazing customer service. We offer many leading brands of marine products, with particular focus on those products that have proven themselves to us over time. We have a broad range of suppliers at our disposal allowing us to source a vast array of specialty marine equipment. We stock a wide array of fish finders, GPS and chart plotters from Garmin and Humminbird. You don’t look at boxes in a locked showcase when you shop for marine electronics at Proctor Marine. All of the most popular models are featured on “live display”. Allow us to turn them on and walk you through the myriad of features that each model has to offer. 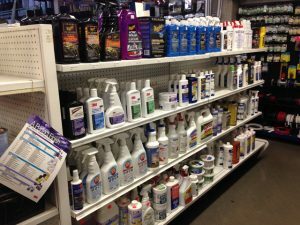 Our selection is diverse and Bob Thompson’s product knowledge ranks with the best in the business. Our every-day low pricing policy means that you don’t need to wait weeks or months for your favourite model to go on sale. Looking for products to protect your boat at the dock? We have a wide assortment of dock lines, brand name fenders as well as several types of dock bumper, dock cleats and related dock hardware. Our extensive anchor selection boasts more than 30 sizes and styles. Shopping for a windlass? We’ve got those too! Marine hardware, stainless steel fasteners, cleaning products, paint, plumbing and sanitation products; we’ve got it all. 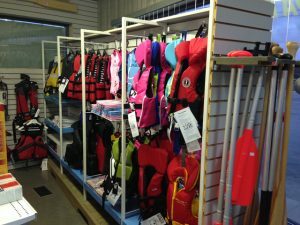 If you need gear or supplies for your pleasure boat there’s a good chance we have it on our shelf in stock today. In the Fishing Accessories section we feature rod holders from brands like Scotty, Cannon and Bert’s Custom Tackle. On the hunt for hard to find products like “The Salty” Down-East Fishing Rod Holder? We’ve got plenty of those too! Our Safety & Floata tion section features Canadian made brands like Mustang Survival and Salus. See us first for ring buoys, buoyant heaving lines, flares, fire extinguishers, radar reflectors, nautical charts and more. We have everything that you need to enjoy a safe, trouble free summer on the water. And there’s more to our accessory store than just boat stuff. Check out our unique and ever changing selection of nautical giftware. We have a great selection of decorative giftware for your cruiser or your cottage. Qualified rigging professionals who can expertly install your marine accessory purchases staff our service department. 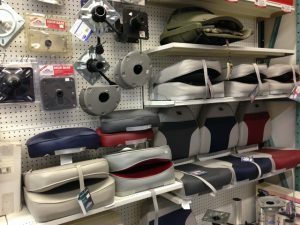 Find almost any marine accessory that you can think of by clicking here. If we don’t have it in stock we will get it for you asap.